The biggest thing I’m noticing about being productive when working from home is that my clothing, my surroundings, and even the lighting effect my work ethic. I have found that I can have uncombed hair, un-brushed teeth, and not even have eaten breakfast, but as long as I’m wearing some sort of form-fitting clothing (i.e. yoga pants, fitted pajama pants, etc) and shoes I work far more effectively than when my hair is combed, my teeth are brushed and I’ve eaten a healthy breakfast in loose-fitting clothing. The same goes for the lighting in my work area. I absolutely love natural lighting. Not only does it brighten my mood, but it keeps me from going back to sleep at 5am when I’m trying to work (at least when there’s sun at 5am). For me, a clean house also keeps me on task and working efficiently. I just feel calmer when my house is clean, which allows the creative juices to flow better. I do have a separate office in my house that I can close the door to – effectively blocking my view of my messy house – but most of you women probably understand that just closing a door is not enough to forget the messes that lie beyond a closed door. Last year, I read a post about Ruth Sokup, of Living Well Spending Less.com’s speed cleaning routine – why she loves it and how she does it – and I fell in love. Over time, our work and home situations (namely, whose working and whose staying home) have changed, but we’ve always adapted Ruth’s speed cleaning routine for ourselves and our current living situation. When we both worked, we both speed cleaned, and would fight over the easiest rooms to clean (true story)! When The Big Guy was a stay at home dad, he speed cleaned as well. Now that I’m working from home, I’ve made still more changes to make a speed cleaning routine work for me – without pulling my hair out. I use a mixture of homemade and couponed-for cleaning supplies. All-in-all I spend about an hour cleaning each morning while the kiddo is eating her breakfast and still bee-bopping around the house not really focusing on anything. I too, work off of a checklist, so that there is no thinking involved in deciding what I will clean and in what order. Plus, I really like the satisfaction of checking off items as I complete them. I also do coupon for cleaners, and while I’m trying to move more towards all homemade cleaners – sometimes you just need to bring out the big guns! If you’re interested in getting a great, comprehensive list of homemade cleaners, this post, also on Living Well Spending Less, is fantastic! Start at the back of the house and work your way forward. I start in the master bedroom, the move to the baby’s room, the guest bathroom, the living room, piano room, dining room, and lastly the kitchen. Organization is the foundation of a good speed cleaning routine. Before I started this, we took a long weekend and cleaned everything, bought all of the totes and bins we needed to organize every single things and labeled like crazy. I use a large bucket for items that need to go to other rooms. Actually, it’s a 5-gallon bucket that we got for free, but it has a handle and works great. Ruth suggests a laundry tote, which works great too! As I move through each room, I empty my bucket of items that belong in that room, and then at the end, I do one last walk-through putting items back in their correct places. Obviously, save the floors for last. Most of our floors are hard, but I really hate sweeping so I have a stick vacuum that I actually do our hard floors with. It’s a Dyson and was kind of expensive, but that little vacuum rocks! I vacuum my floors each day (carpeted and hard wood), but then 2-3 times a week I mop the hard floors. Mopping just depends upon how muddy outside is. The carpeted floors get vacuumed every day, and we steam clean them once a month. Glass cleaning: Ruth does spot glass cleaning every single day, but I actually do a full glass cleaning every day. I’ve gotten pretty quick at it, and even though some might say it’s unnecessary to do every single day, with 2 dogs and a not-quite 2-year old in the house, believe me, it is! I clean the shower for a few minutes each day, but not during speed cleaning. Each night when I shower, I spray down a portion with shower cleaner and keep a scrub brush in the shower. My rotation looks like this: front panel, side panel, back panel, inside of the tub. Toilet Brush: I got this tip from Ruth, so I can’t claim it, but I store my toilet brush in a container of bleach so it’s ready to use a moment’s notice. Each week or so I replace the bleach. Easy peasy. Make the bed: I actually do this each morning after I wake up, so this is usually done by the time I get around to cleaning. I find that this is an excellent way to start my day. Pick up clothes laying on the floor, toys, dishes, etc. 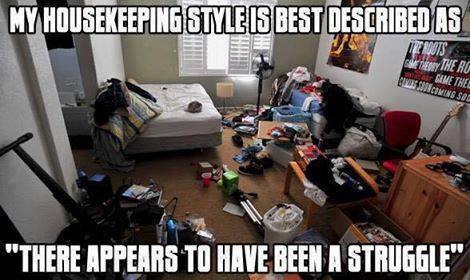 Pay special attention to the nightstands and dresser – I like mine to look neat and clean. Grab the laundry hamper and set it out in the hall. Squirt the mirrors with windex and wipe down. Wipe down stovetop. Each day I pick a burner to really scrub on, and then I move on. Grab your stick vac or broom and start from the back of the house and work your way forward, sweeping/vacuuming every room as you go. Grab your glass cleaner and clean windows and doors that have glass at dog/kid level. Take one last walk-through and put away items that are still in your bucket. My cleaning method is far from perfect, but it’s quick, it’s painless, and it’s super easy. Basically, it works for us and that’s the important part. I’ve created a PDF of my daily cleaning checklist that you can download and use/modify for yourself. Download the checklist by filling in the form – the checklist will be emailed to you! How do you stay on top of household cleaning? Share your tips below! I agree – what I wear and how the clean the house is makes a big difference when I work from home! Thanks for the reminder! Hi! I LOVEEE this! Am I missing the form to fill out for me to print it? Thanks for sharing your cleaning routine. I also have my own ways of cleaning. I think that the perfect time to start cleaning is during the morning too. It’s totally satisfying to see a clean house after hours of cleaning. I believe that you’ll get used to it when you make cleaning a habit. Hello! Which form do I fill out for the checklist? The email subscription? Let me know!